Remember during JDRF Government Day last year, when CEO Jeffrey Brewer said that there was going to be outreach directed towards adults with T1? The JDRF Kansas City Chapter has done an incredible job turning that vision into a reality. I did JDRF Kansas City walks as a kid, but had not been involved in the organization for quite a long time. Sometime last year, after meeting Scott, he invited me to a local JDRF event. It was an Adult T1 group. So I went to the meeting. And the rest, as they say, is history. Major props to our Outreach Coordinator, R. In addition to just being a lovely person, she organizes some great events and does her best to keep our ragtag bunch on track. I love R! I am so grateful for her hard work, as well as all the others at the JDRF KC office. Our Adult T1 group meets at least every other month (sometimes more often) and the topic varies from month to month. We've had a CDE come in and answer questions, and a few weeks ago I had the honor of presenting with Scott and Babs about the Diabetes Online Community and the power of social media. Thank you, R, for allowing and encouraging us to do that. It was great! I sincerely hope that someone who attended the meeting has done a little exploring into the DOC. We are a small but mighty group. There are only between 10-20 people at most meetings. But I have high hopes that the group will grow. I am SO EXCITED about the potential in all of this. And as if all of that isn't enough to be excited about, I also have the honor of being a part of the JDRF Kansas City Young Leadership Committee! (We're trying to think of a different name for the committee, so if you have any good ideas, please let me know). We had our first YLC meeting before the holidays. A lot of great awareness and fundraising ideas were shared, and I'm excited to see where it goes. Additionally, next Saturday, February 4th, I will be attending the JDRF KC T1D Connections Retreat. This is an annual event, but this year, they are offering an adult track for the first time. Woohoo! I am really looking forward to participating. There are also tracks for kids, teens, parents, and caregivers. If you're in or near Kansas City, I encourage you to come! You have till January 30th to sign up. More information can be found here. Thank you R, and everyone else at the JDRF KC chapter. You are making a difference. It's really nice to be able to connect with other adults with diabetes in person. Sitting around eating pizza, joking about what said pizza is going to do to our bgs. It's that same magic that happens whenever you get together with other PWD. I love that magic. So thank you for that. And for making good on the promise to reach out and provide support for adult PWD. I am so grateful. I feel so blessed to have a chapter that is headed in this direction, because I know that not all JDRF chapters are there yet. I can't wait to see what the future holds! I want this. So happy you have it. i want this too! its great to be part of the DOC, but i would like to get involved with some "real"(read other PWD) people in my town. I along with my CDE from paediatrics set up a local support group for teens with Diabetes in my area. We are small, too, but we have come so far and done so much in the past few years, so I feel your excitement. It is wonderful. I am glad you have this. I'm envious. If you go to the NH JDRF page it's mostly about fundraising. I'm so glad you're part of a new and great group of d-people! I am excited to attend the connections retreat and support all the awesome stuff your chapter is doing! 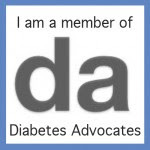 my husband was just yesterday lamenting the numerous squandered opportunities for connections we feel have come from our local JDRF. i told him there were people out there who had awesome experiences and i that was before i even read this post! so glad you guys are getting this support!